To date, only 10 states in the United States have no state or local ban-the-box (or “fair chance”) laws or policies. Twenty-three states have adopted ban-the-box laws governing public employers, and 11 states have enacted ban-the-box statutes governing both public and private employers. In six states, local laws have been enacted without a statewide fair chance legislation. Over 150 cities and counties have ban-the-box laws on the books, 17 of which include restrictions on private employers. One advocacy group estimates that approximately 75 percent of U.S. population lives in a jurisdiction with a ban-the-box policy. New Ban-the-Box Law in Westchester County, NY: On March 4, 2019, Westchester County, New York, joined the ranks of cities and counties that have enacted “ban-the-box” laws on private employers. The law, “The Westchester Fair Chance to Work Act,” adds to the ban already in place for the County’s public employers. It restricts employers from asking questions about criminal history on initial job applications or using criminal history as a criterion in job advertisements. However, unlike neighboring New York City and other more strenuous ban-the-box laws, Westchester County employers are permitted to ask questions about an applicant’s criminal history after receiving an employment application. Suffolk County, New York (Effective June 30, 2019): Suffolk County has become the most recent New York jurisdiction to adopt a ban on employer inquiries into salary, benefits, and compensation history. The ban extends to all steps of the hiring process. As with many similar laws around the country, in addition to prohibiting verbal inquiries into compensation, the law specifically prohibits employers from conducting searches of public or open source reports containing the applicant’s salary records. Atlanta, Georgia (Effective February 18, 2019): The salary history question is now forbidden when applying for positions with the City of Atlanta. Illinois (Effective January 15, 2019): In 2018, two bills that would ban salary history inquiries were vetoed by the governor. But in 2019, on his first day in office, the newly elected governor issued an executive order banning state agencies from asking the question as part of the hiring or promotions process. Michigan (Effective January 8, 2019): In Michigan, state law prohibits local and county governments from enacting salary history ban statutes. However, a week after taking office, the newly elected governor issued a directive prohibiting state departments and agencies from asking applicants for their salary history until after a conditional offer of employment with a proposed salary has been made. Connecticut (Effective January 1, 2019): All Connecticut employers are covered under the law, prohibiting inquiries into a job applicant’s wage and salary history. Inquiries are permitted if the applicant voluntarily discloses the information. Employers may inquire into compensation arrangements but not into the value of the compensation. 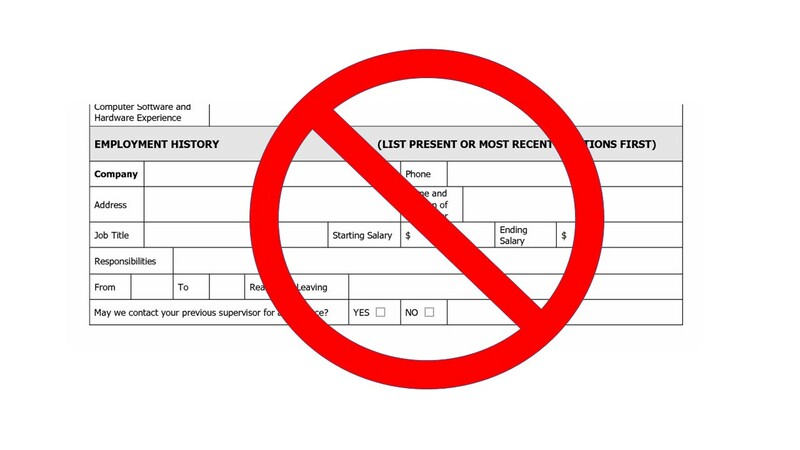 As will most, if not all, salary history bans, the Connecticut law does not extend to certain jobs under a federal or state law that specifically authorizes disclosing or verifying salary history for employment purposes.